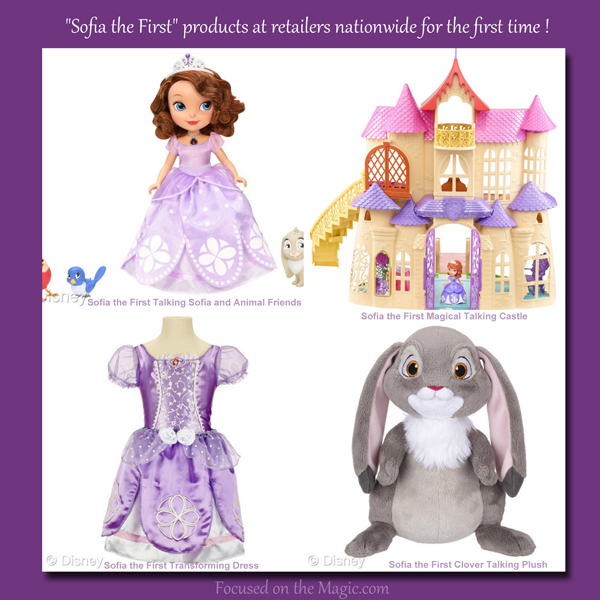 Disney Consumer Products (DCP) today announced the launch of "Sofia the First" products at retailers nationwide for the first time starting this month (previously only available at Disney Store locations). From key licensees such as Mattel, JAKKS Pacific, Jay Franco and others, the expanded product offering features an assortment of items inspired by cable TV's #1 series among kids 2-5*. 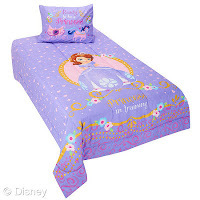 The line includes Sofia's iconic dress and amulet necklace, home décor bedding and bath accessories, apparel, as well as an assortment of dolls, plush, a castle and more. The line was unveiled in New York at Disney's annual holiday preview to the press and mom bloggers showcasing what is arriving at retailers this month and what is in store for the holidays. 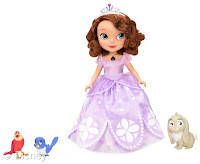 "Since the debut of "Sofia the First" on Disney Junior last year, we have heard from parents whose children have asked for everything from a Sofia doll to her dress and the magical amulet. 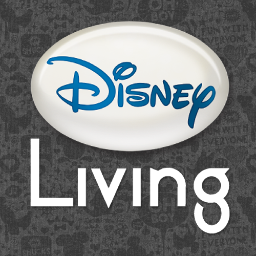 After a successful launch at Disney Store, we're excited to give parents an even bigger selection of products to delight their preschoolers and extend the storytelling," said Josh Silverman, executive vice president of global licensing, Disney Consumer Products. "As Sofia and her cast of characters continue to grow, we look forward to bringing fans more magical products to experience the series." 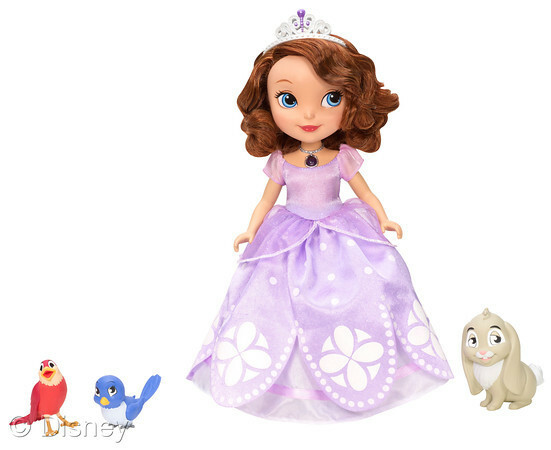 Sofia the First Talking Sofia and Animal Friends by Mattel (MSRP: $39.99): Wearing her special amulet from the King and signature princess gown, the talking Sofia doll can recognize and talk with three of her best animal friends: Clover the Rabbit, Robin the Robin and Mia the Bluebird. 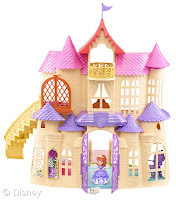 Sofia the First Magical Talking Castle by Mattel (MSRP: $59.99): When girls place Sofia or Clover the Rabbit on the castle's special base, they can "magically" hear phrases said in each character's voice. Other dolls and figures from across the line unlock even more character phrases. 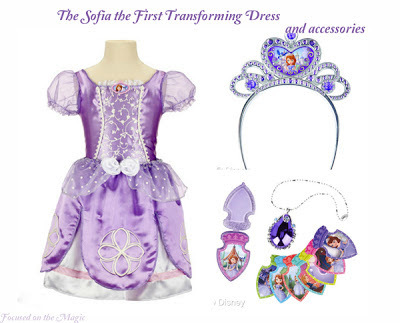 Sofia the First Transforming Dress (MSRP: $19.99) and Magical Amulet (MSRP: $14.99) by JAKKS Pacific: The Sofia the First Transforming Dress features two dresses in one and comes with a free collectible magic lesson card to use with the interactive talking magical amulet which features the voice of Sofia and teaches little girls valuable princess lessons about kindness, sharing, manners and more. The talking magical amulet comes with 12 collectible cards. Sofia the First Talking Clover Feature Plush by JAKKS Pacific (MSRP: $19.99): Soft and cuddly Clover loves to chat with friends. 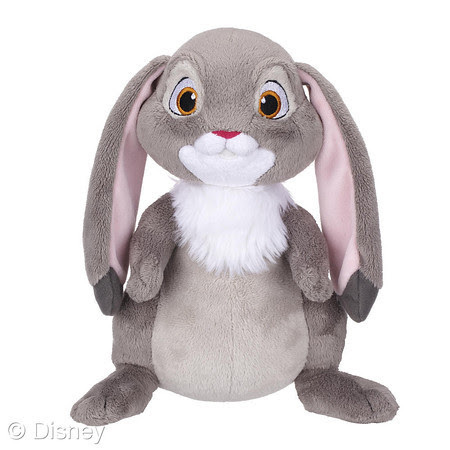 Press his tummy and feed him his cookie to hear him say five different phrases from the show; he also comes with a free collectible magic lesson card to use with the talking magical amulet. Sofia the First Bedding Collection by Jay Franco (MSRP: $23.99 - $59.99): Send your princess in training off to dreamland in this Sofia the First bedding set available exclusively at Toys R Us. Sofia the First Tee Shirt by Freeze (MSRP: $12.00): Your child will be voted ''Best Princess in Class'' while wearing this tee featuring Sofia the First and her friends Clover the Rabbit and Robin the Robin. 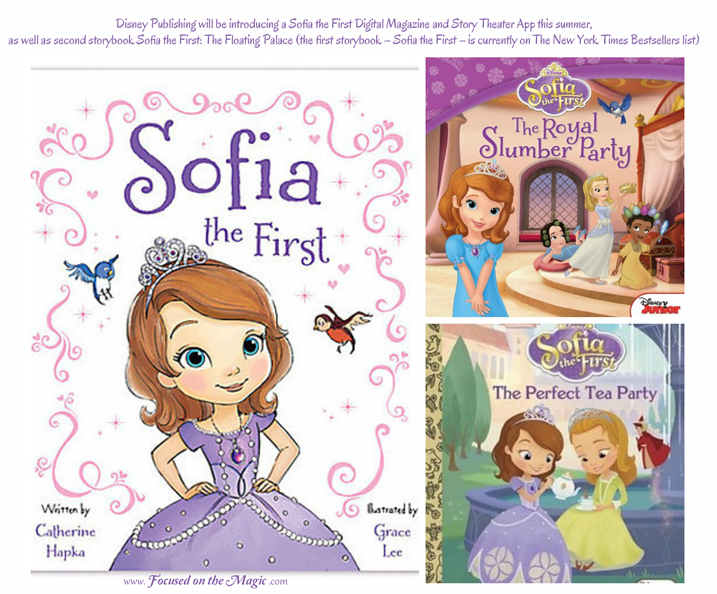 Disney Publishing will be introducing a Sofia the First Digital Magazine and Story Theater App this summer, as well as second storybook Sofia the First: The Floating Palace (the first storybook – Sofia the First – is currently on The New York Times Bestsellers list). "Sofia the First" is set in the storybook world of Enchancia and tells the story of Princess Sofia, an adventurous little girl who is learning how to adjust to royal life after her mom marries the king and she becomes a princess overnight. In each episode, Sofia addresses girl-relevant themes and lessons, educating young girls on how to embody key qualities such as kindness, generosity, loyalty, honesty and grace. "Sofia the First" airs daily on Disney Channel and Disney Junior. For the entire Sofia the First assortment, visit participating retailers nationwide and online. Disney Junior's animated television series "Sofia the First" is set in the storybook world of Enchancia and tells the story of Princess Sofia, an adventurous little girl who is learning how to adjust to royal life after her mom marries the king and she becomes a princess overnight. Disney's first little girl princess, Sofia was introduced in the music-filled animated television movie "Sofia the First: Once Upon a Princess," which debuted on November 18, 2012 and became the #1 cable TV telecast of all time in Kids 2-5 and Girls 2-5, and the #1 preschool cable TV telecast ever in Total Viewers and Women 18-49 (according to Nielsen). Created for kids age 2-7 and their parents/caregivers, the stories in "Sofia the First" are designed to communicate positive messages and life lessons applicable to young children. Each 22-minute episode of "Sofia the First" follows Sofia as she goes on an adventure and either learns some lesson herself or helps others around her learn a lesson. Starring as the voice of Sofia is Ariel Winter ("Modern Family"); Sara Ramirez ("Grey's Anatomy") is Queen Miranda; Wayne Brady ("Let's Make a Deal") is Clover the Rabbit; Tim Gunn ("Project Runway") is Baileywick; Darcy Rose Byrnes ("Desperate Housewives") is Amber; Zach Callison ("Land of the Lost") is James and Travis Willingham ("Ultimate Spider-Man") is King Roland II. Disney legend Russi Taylor (Minnie Mouse), Barbara Dirickson and Tress MacNeille (Daisy Duck) bring Fauna, Flora and Merryweather, respectively, to life.